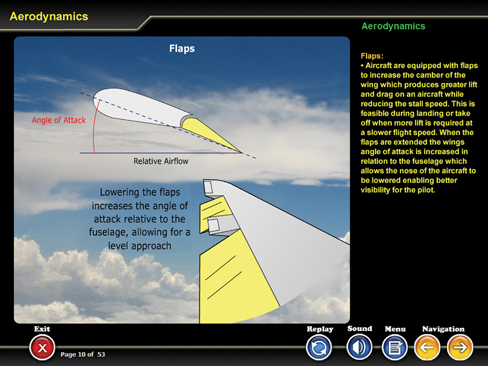 EASA 66 Module 8 covers the basics of Aerodynamics. Topics in this 53 page course include Physics of the Atmosphere, Aerodynamics, Theory of Flight, and Flight Stability and Dynamics. International Standard Atmosphere (ISA),application to aerodynamics. Airflow around a body; Boundary layer, laminar and turbulent flow, free stream flow, relative airflow, upwash and downwash, vortices,stagnation;The terms: camber, chord, mean aerodynamic chord, profile (parasite) drag, induced drag,centre of pressure, angle of attack, wash in and wash out, fineness ratio, wing shape and aspect ratio; Thrust, Weight, Aerodynamic Resultant;Generation of Lift and Drag: Angle of Attack,Lift coefficient, Drag coefficient, polar curve,stall;Aerofoil contamination including ice, snow,frost. Relationship between lift weight, thrust and drag;Glide ratio; Steady state flights, performance;Theory of the turn;Influence of load factor: stall, flight envelope and structural limitations;Lift augmentation.